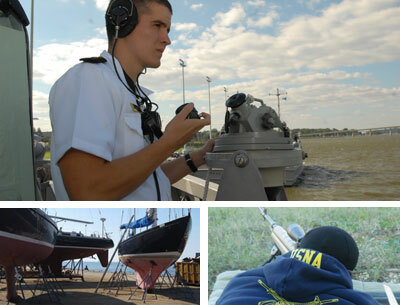 Waterfront Readiness Department is charged with operating the Marksmanship Training Unit, Small Craft Repair Facility, and the Yard Patrol Operations. The mission of the Marksmanship Training Unit is to provide for the professional training of midshipmen and others in the use of small arms, with particular emphasis on safety and proficiency. The mission of the Small Craft Repair department is to provide Hull, Mechanical, and Electrical support to Yard Patrol (YP), sail, and auxiliary craft used to support the United States Naval Academy's "Excellence at Sea" programs. Our primary objective is to provide safe and reliable platforms for training midshipmen. Our repair capability is comparable to the best civilian boat yards. The mission of the Yard Patrol Operations is to provide for the operation of Yard Patrol craft and Utility Boats, and the coordination of visiting vessels to the Annapolis Area Complex in support of midshipmen training.